How often do you think about the huge, healthy boost you give your body every time you sweat? Sweating is the body’s safe and natural way to heal, stay healthy, and detox because it carries toxins out of the body through the pores. Exercise of course is a great way to get your sweat on, but so is some relaxing, quiet light therapy in a far-infrared sauna. Far-infrared saunas omit infrared light waves that create heat in the body, causing you to sweat and release stored toxins through your skin. 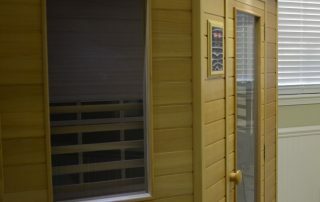 Our infrared sauna heats your body gently, yet penetrates the skin on a deeper level, creating a more relaxing and comfortable experience than a traditional sauna. The heat from a far-infrared sauna provides all the healthy benefits of natural sunlight without the harmful effects of solar radiation.